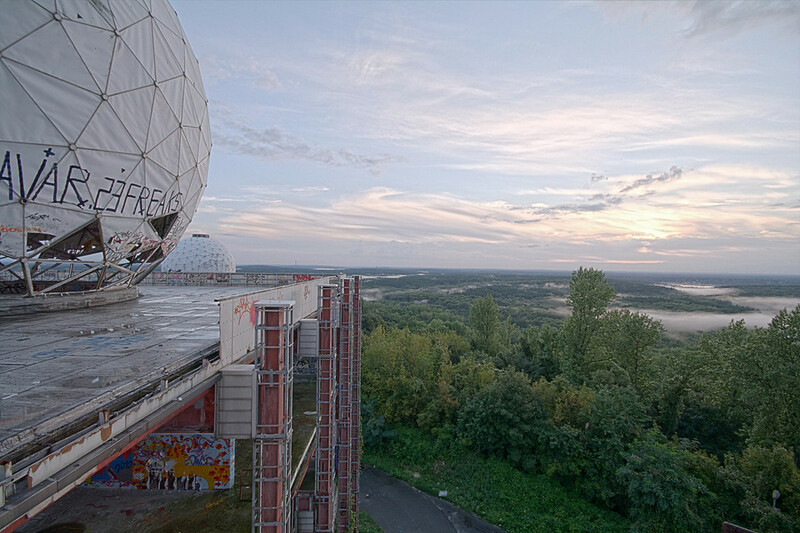 The abandoned NSA Listening Station on top of the Teufelsberg is one of the most well known Locations in Berlin. I had enjoyed the view from the top already during the night, so now it was time for a visit during the day. It is such an immensely popular place that even though the fence gets repaired quite frequently, new holes appear even more frequently. There are now even squatters living on the terrain, but they too have long given up trying to keep people out and now are generally friendly but occasionally do call the police when too many idiots run around. I took the long march from the train station up the hill during rather unstable looking weather conditions but arrived dry. While looking for an entry, I noticed two bikes chained to the fence. So at least two other intruders inside. Inside, everything looked as boring as I expected. So I headed directly up to the roof of the main building. When I stepped out of the staircase, a torrential rain had started. Two French guys were on their way down, but they paused in one of the radomes, waiting for the rain to stop. The bikes were theirs. Luckily, the rain stopped as quickly as it had started. I continued my way to the top and the French went back to their bikes. 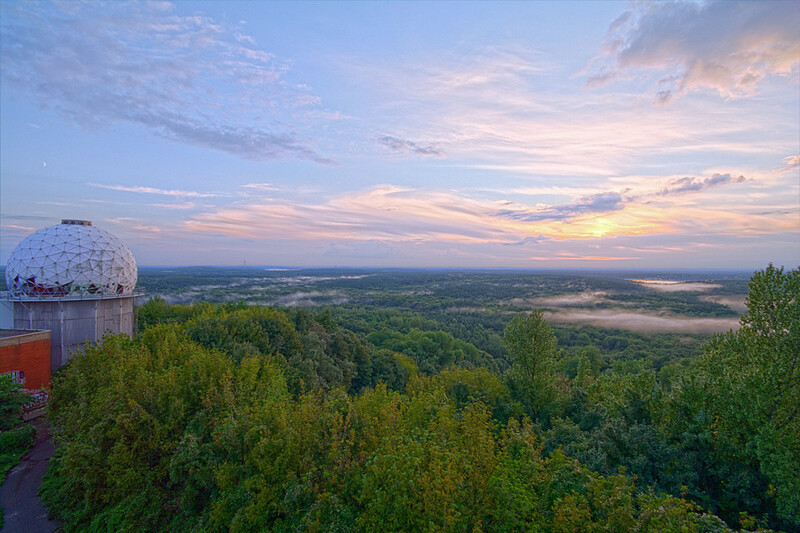 The top dome allowed a stunning view over the forest that surrounds the Teufelsberg and the city beyond. And due to it's very round shape, it had really spooky acoustics. I could hear myself breathing and every step of my feet and click of my shutter echoed from all around me. 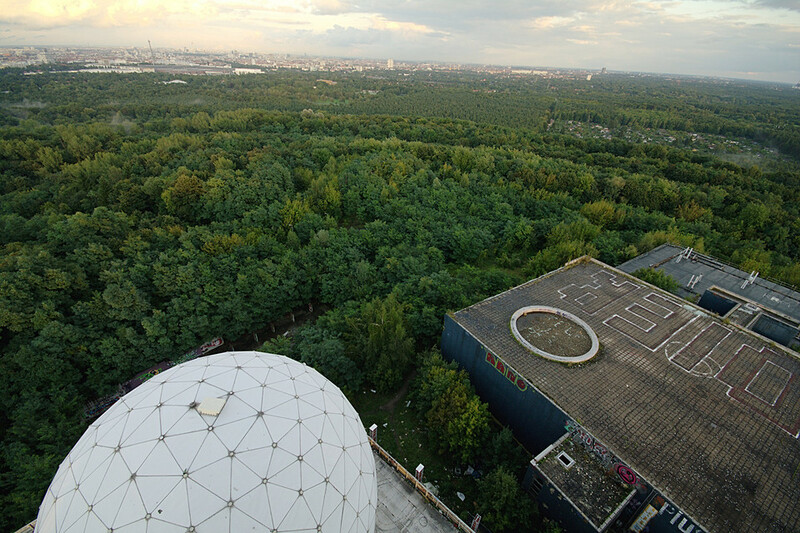 Since that was about all there is to see at Teufelsberg, I decided to walk back to the train station. But of course not without enjoying the immensely high dynamic range sunset that presented itself with crystal clear after-the-rain air, evening fog building up over the forest, and an orange sun in the middle of a blue sky, topped of with a few high altitude clouds and a guest appearance of the moon. Quite scenic.